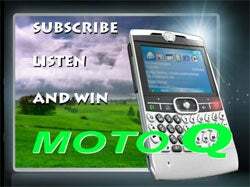 Our fellow phone aficionados over at Mobility Today are giving away a Motorola Q! All you have to do is subscribe to their podcast—which is entertaining in and of itself—and listen for the contest buzz word. The first person to identify all of the correct contest buzz words will win him or herself a shiny new Q. Head on over to MobTod for the full contest rules and your chance to enter. Who knows, maybe one of our Gizmodo readers may win it.